Chanting brings about a state of calm and clarity, a sense of peace, quiet and relaxation, a reduction of pain in the body, a sense of order in everyday life. Jill Purce reveals the rainbow colours of the voice by the ancient shamanic vocal practice of overtone chanting. She makes audible the natural harmonic spectrum of the voice so that the ethereal angelic bell-like tones of the voice are heard floating above a continuous bass note of the deep voices of the chanters. Listening to this meditative recording is an ideal practice for meditation and learning this ancient shamanic vocal technique. It is deeply relaxing, used by countless cranio-sacral therapists, massage therapists, and healers, who report dramatic healing effects it has on their patients. 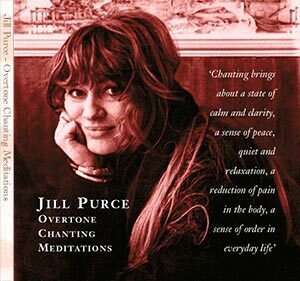 "Jill Purce's chanting will help you discover the magical and mysterious in you. Through these chants you will encounter your sacred self and your life will be changed forever"
Vocal teacher Jill Purce gave an inspiring and moving lecture to over a thousand people in Prague on Midsummer's Day. In this recording, she reveals the magic of the voice and shows how profoundly chanting can affect us. Jill discusses why traditional societies have always chanted, whereas modern Western society has stopped, and shows what happens when we rediscover our voice, and explains how we can recapture the ancient ritual of group chant. Jill also demonstrates the extraordinary sound of overtone chanting. Her exciting lecture is followed by chanting and then by a guided meditation, to bring the many benefits of chanting into your deepest awareness.